Happy Friday to you all and how are you all? 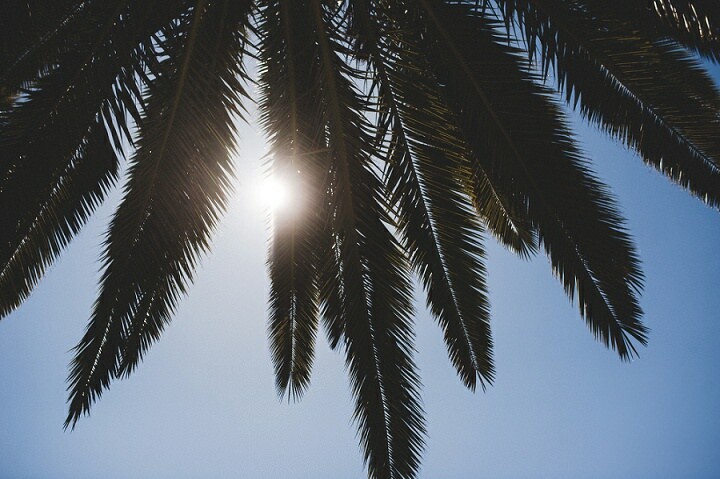 Looking forward to the weekend? I know I sure am, even though I work on Saturdays I still get that Friday feeling every week. 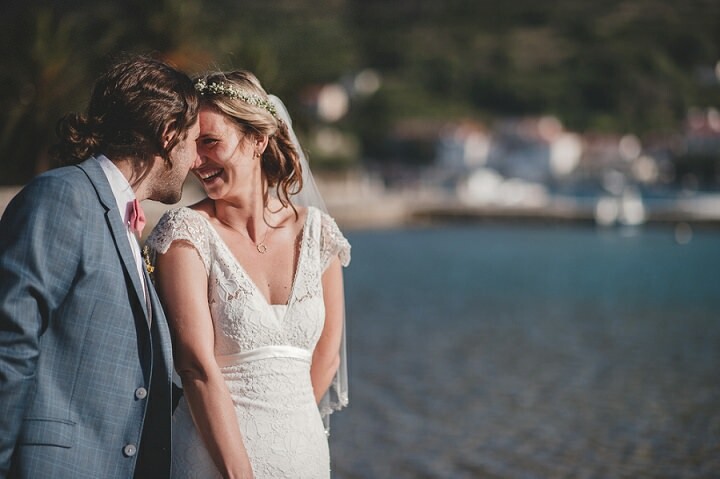 To finish off the week in style I have an absolutely stunning wedding for you, featuring the most amazing scenery and some beautiful documentary photography from Zvonimir and Danijela from One Day Studio. 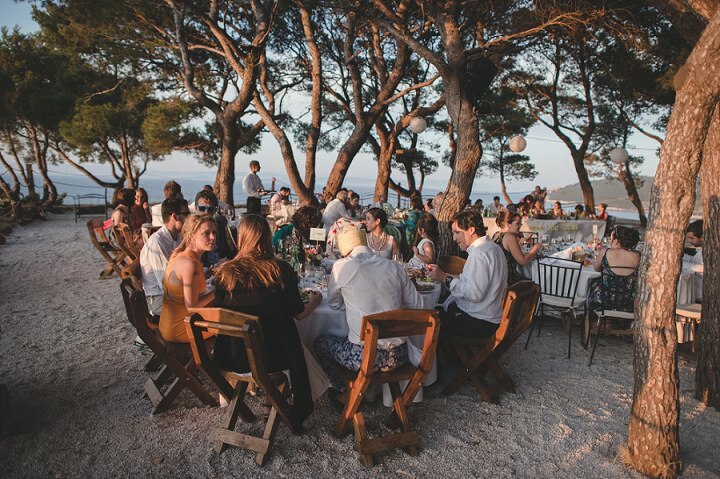 The wedding takes place in Croatia which really is a magnificent location for a wedding, just breathtaking. 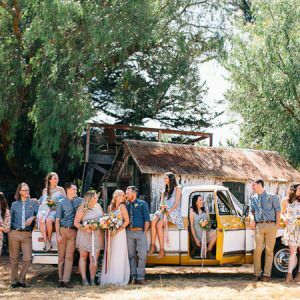 These gorgeous photos see us with the bridal party and guests from the set up of the wedding, the pre wedding dinner, right though to the church service and the magnificent reception. 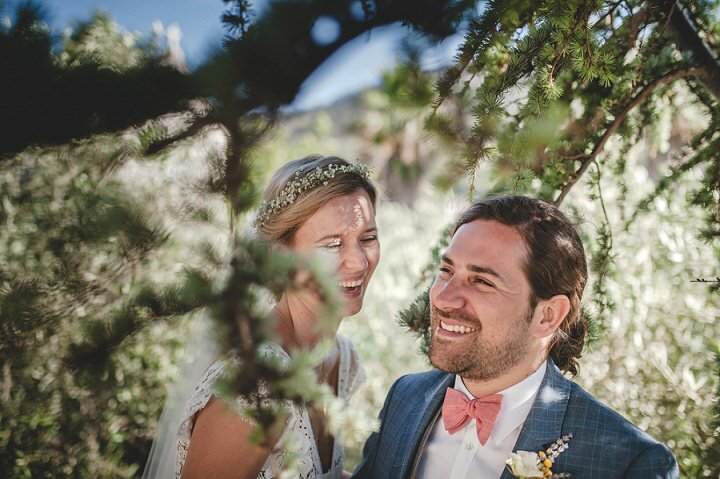 I love everything about this wedding, the relaxed boho feel, all of the little handmade touches but most of all the gorgeous couple, Tanja and Rafael in this most beautiful of settings. With some amazing sunshine what better way to finish off the week in style! 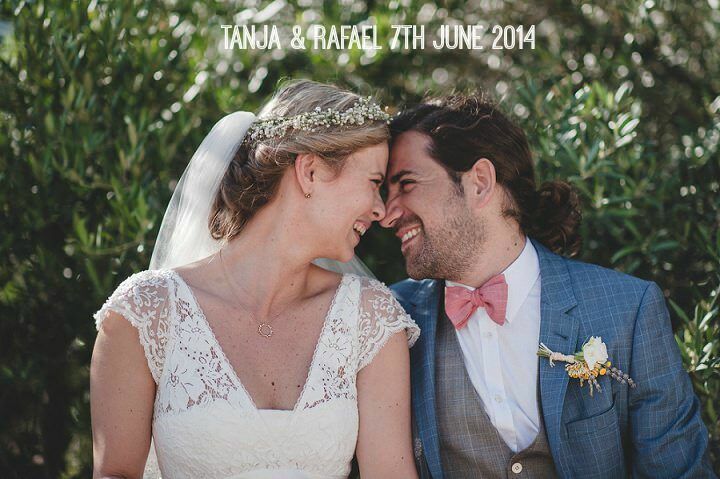 Tanja and Rafael were married on 7th June 2014. 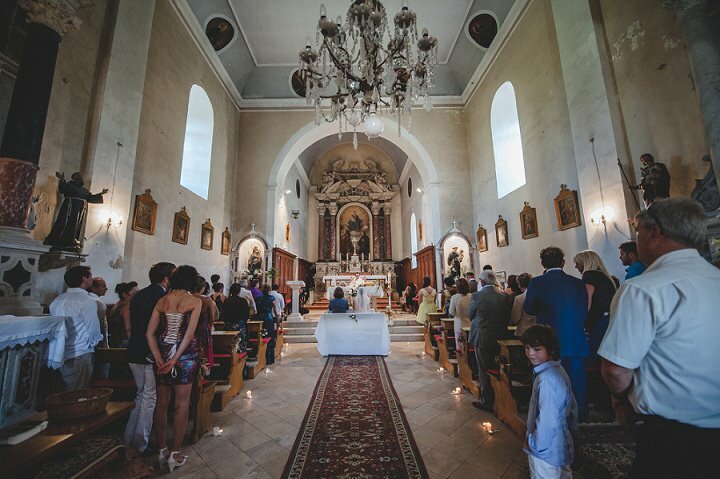 The ceremony was held at Church St. Jere, island Vis in Croatia and the Reception at Fort George. 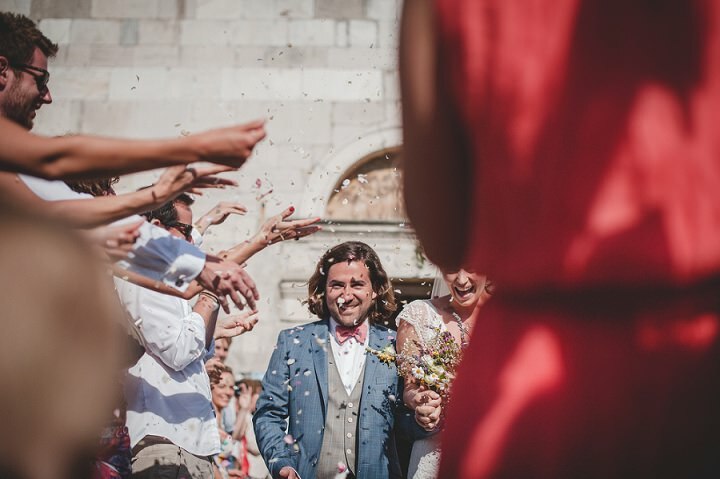 ‘Rafa and I wanted an intimate and relaxed wedding, under the blue sky, surrounded by trees, sea and closest family and friends. 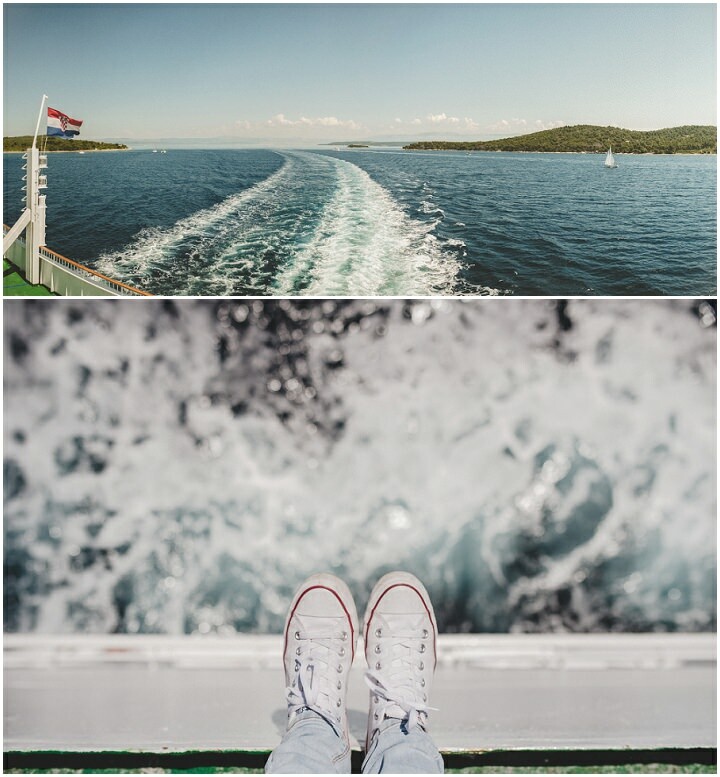 As we had many guests traveling from abroad, we decided to make it into a little holiday getaway and sail everyone onto an island. 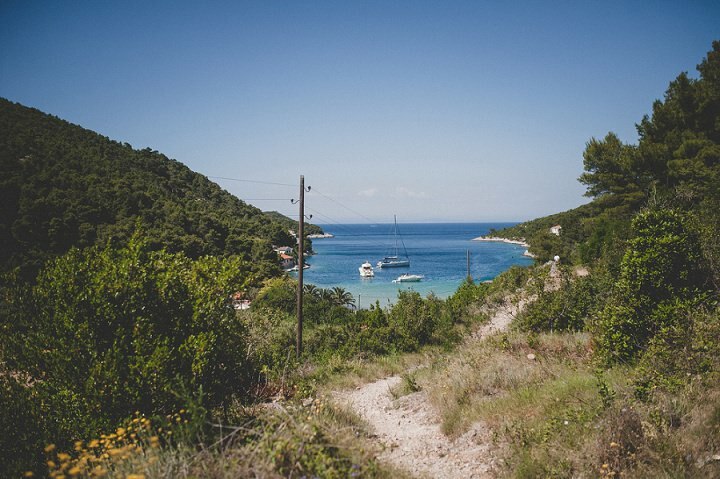 Vis island is one of those well-kept Adriatic secrets and remained a simple and authentic fishing and winemaking paradise. 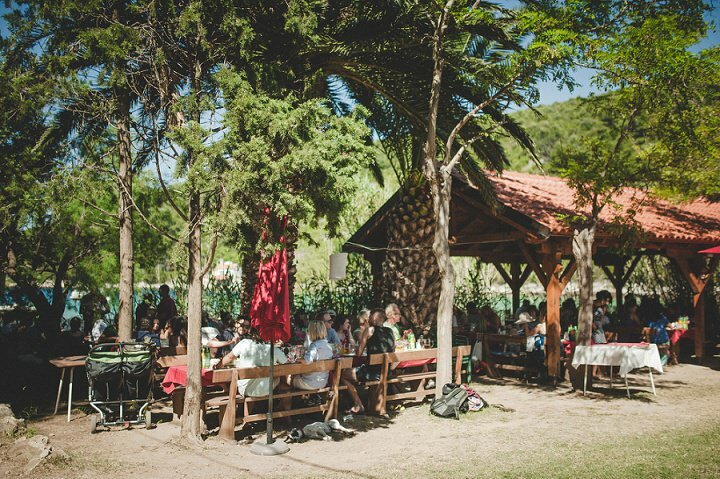 This peaceful oasis of raw, unspoilt natural beauties and rich history, 2 ½ hours boat ride from Split, and worlds away from the tourist hustle and bustle, was perfect for our little circus of love! When we first saw Fort George there was no doubt in our minds that this is where we want to hold our wedding celebration. 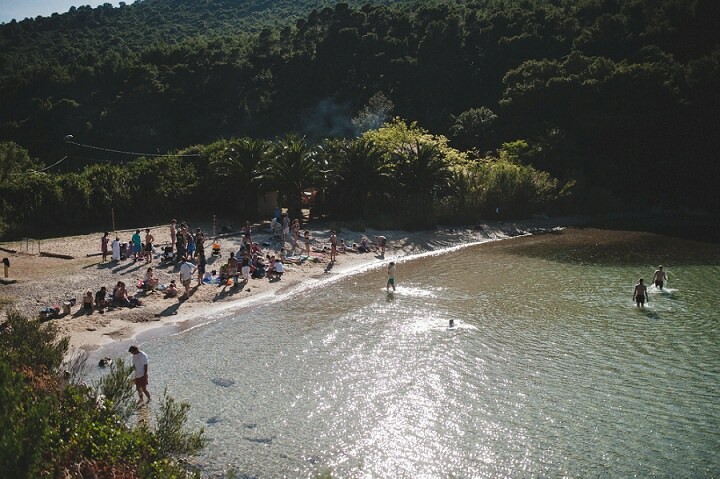 This absolutely magical 200 years old, medieval English fort is built on a hill, hidden behind thick pine trees, somewhat 3km from the town Vis. 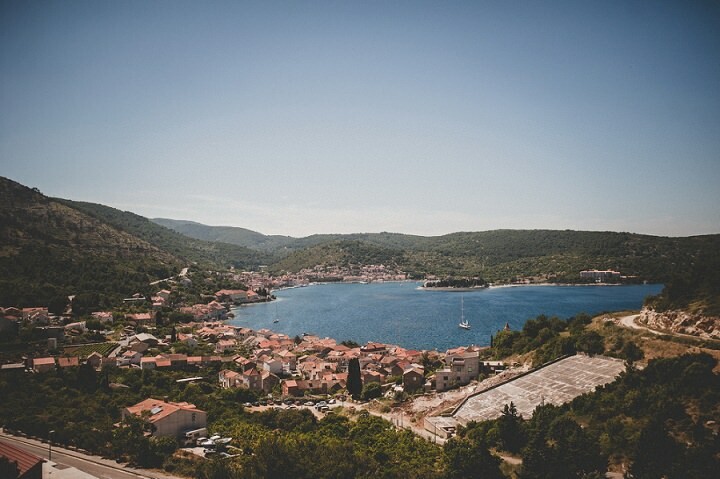 It overlooks nearby islands and boasts breath-taking views of endless Adriatic sea. 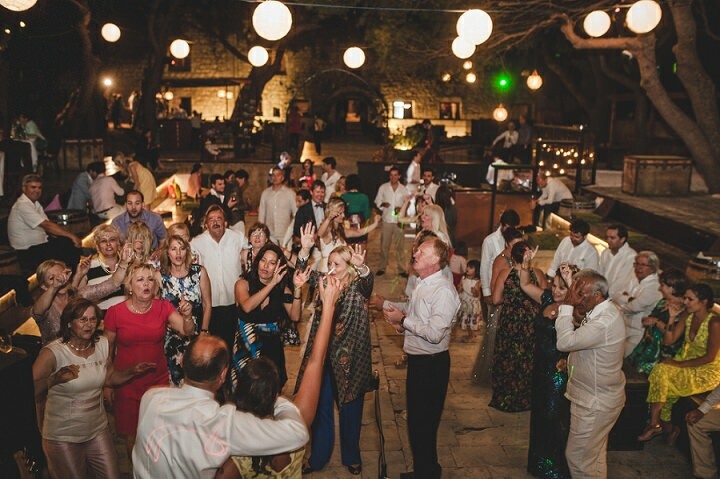 On the top of the fort is a massive stone floor terrace where we had our Welcome reception. We met while we both lived and worked in London in 2011. 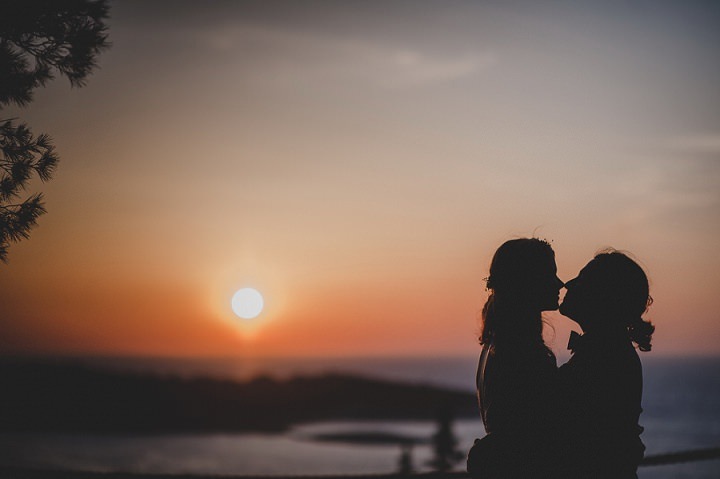 Rafa was just about to leave for his travels, and I just just returned from mine… It was a twist of fate that placed us both in the same place at the same time, and ignited a very close friendship into love. But in all honesty, the connection must have been formed many lives before, otherwise, how else would you explain that it took Rafa only a few days to ask me to share his journey and the rest of our lifetime with him! Without hesitation, I said yes – and that was it. 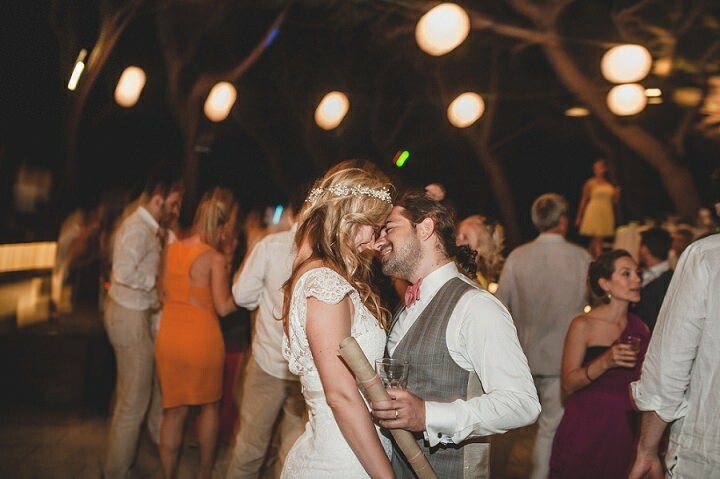 From that moment we were married at heart, and we went on a one-year long honey moon before the official wedding. 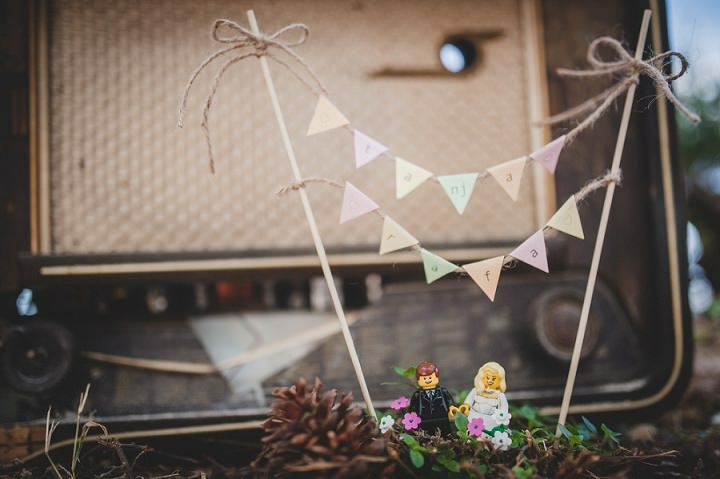 We searched the world to find that little piece of paradise to park their love caravan. 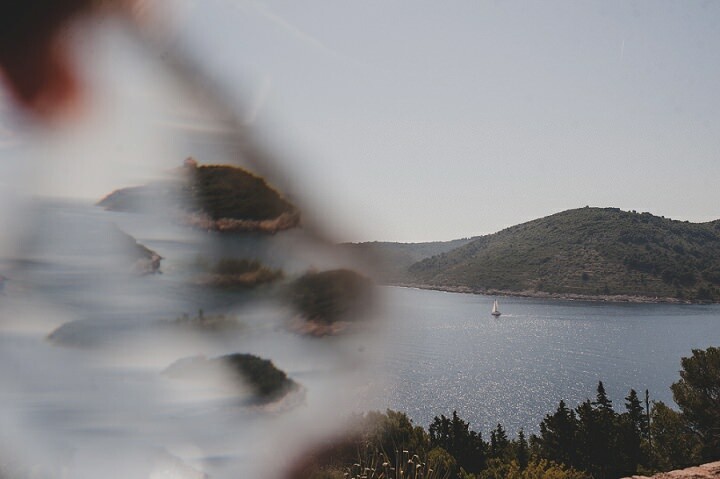 And they found it under the Croatian sun. Even though Rafa told me he will marry me only 3 days after our first kiss, and he kept repeating that sentence every single day after that, he popped the actual question about six months into our relationship. This is when he travelled half way around the world, breaking his tight budget backpacking trip through Asia just to be with me for my birthday. Apparently, he hasn’t planned the proposal, he just felt so strongly about us that he couldn’t hold it anymore. 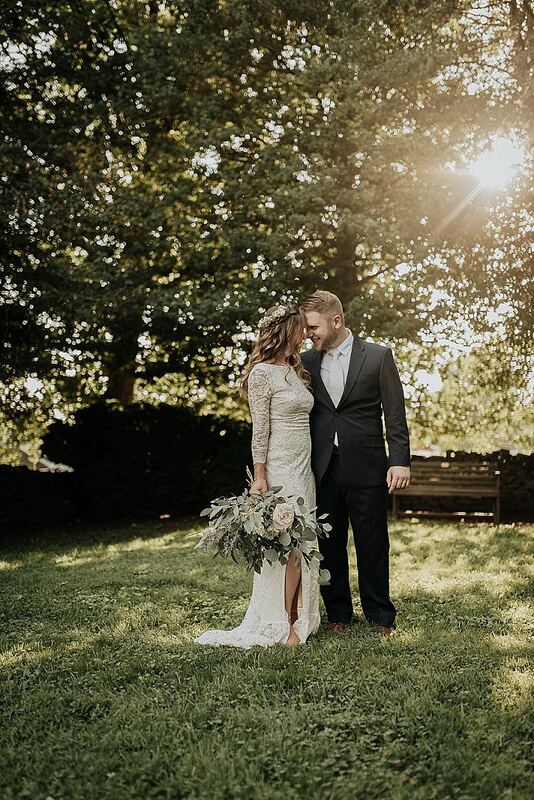 He must have looked way pass my smudged make-up, messy hair and sweaty clothes when he decided to wake me up at 7am, after a crazy birthday night out, and tell me all about how great this love of ours is. A borrowed plastic ring, hugs, tears, kisses, more tears, more hugs, and we were engaged! Just like that. 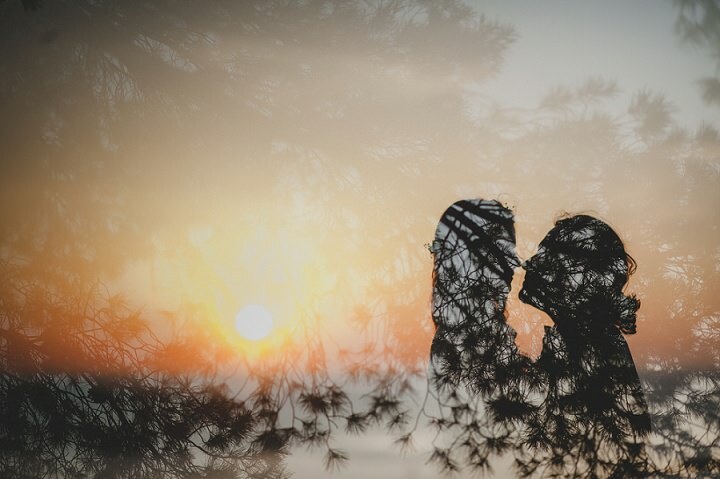 It was a very intimate and impulsive proposal, done in such a sincere and emotional way that I couldn’t even dream of… That morning remains one of the most beautiful moments of my life. Our budget was very limited, so I tried to DIY as many things as possible. However, 70% of the budget went on the catering and beverages. The rest was photography, dress and DIY. 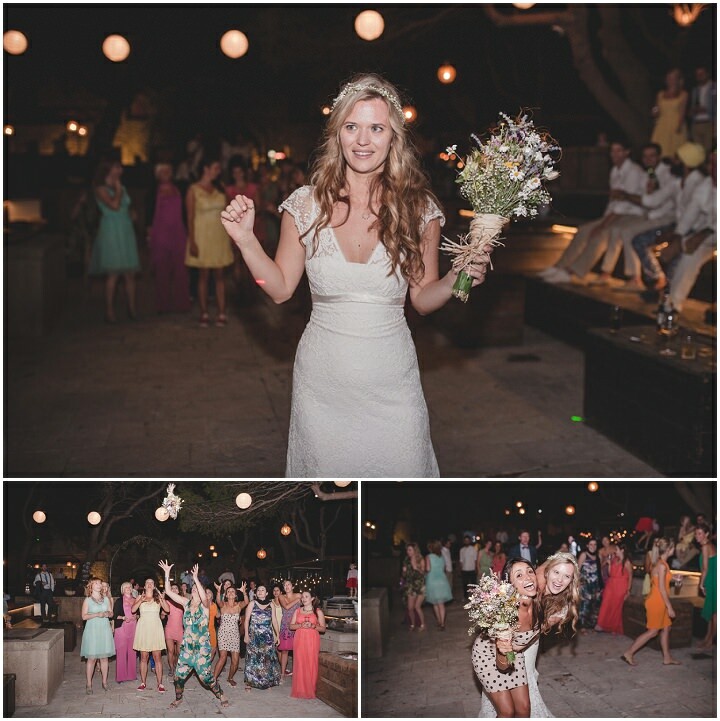 We saved money on music as my band was playing, and rather than hiring a DJ we had a playlist. A lot of online browsing, including good old Google, but also local forums. I must have visited hundreds of pages, when someone wrote a very good review of One Day studio. 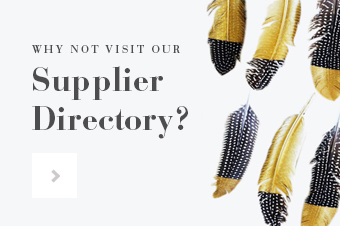 One click on their website, and there was no compromise for me. It just had to be them! 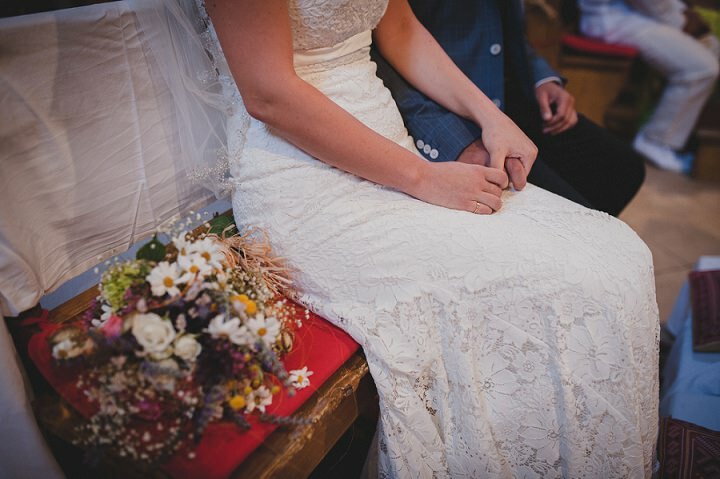 The dress was made of a beautiful vintage-like Spanish lace that we re-styled, added sleeves and cut the cleavage. After midnight, I changed to a short, cream, backless lace dress from ASOS that allowed more freedom on the dancefloor. 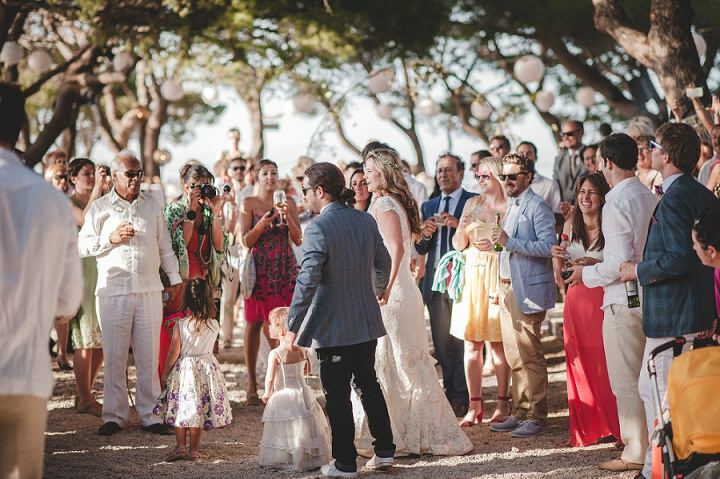 For the ceremony, I had simple flat sandals with gold detail from Accessorize and Rafa and his best-men were wearing white Startas a legendary Croatian handmade canvas trainers. Girls also changed into Startas later on, for the dancefloor, but ours were in red colour. Rings were made two days before the wedding by my cousin, a talented jewellery maker from Split. They are both identical in shape and size, polished brushed light gold, with engraved dates on the back and a special word for both of us. I wore vintage gold earrings that I got when I was born from my Godmother. Around the neck I had a beautiful golden Burning Sun necklace with a very special meaning about strength and eternity, given to me by my two incredible Maids of Honour on the day of the wedding. Rafa was wearing Ted Baker’s mix and match – navy chinos, a light blue jacket, a delicately patterned grey waist coat, with a simple white shirt. He also had a pink handmade bow tie, custom sewn by our friend Rob. 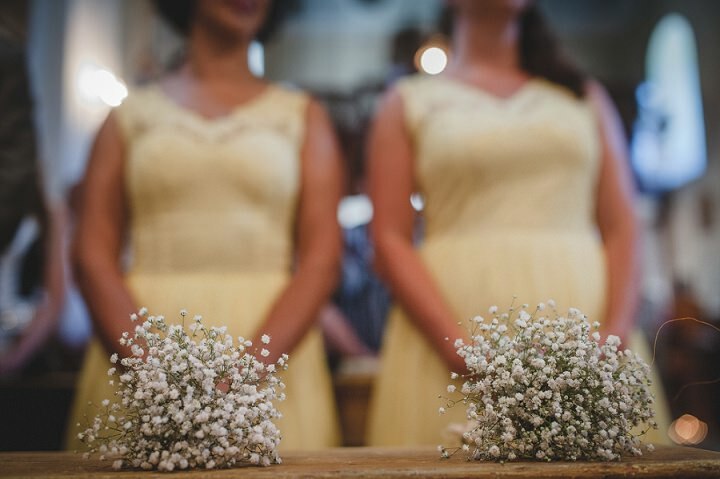 Maids of Honour (Ana and Anna) were wearing identical short, lacy daffodil yellow dresses. 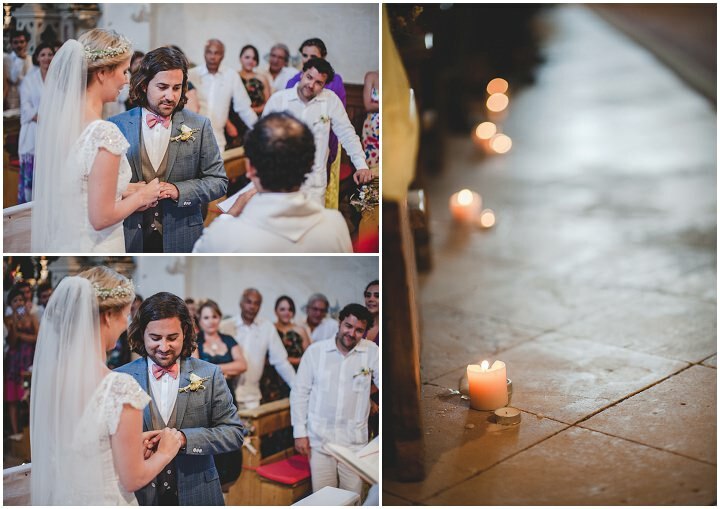 Best Men were wearing traditional Colombian guayabera (white linen, plated shirt) and cream chinos. There was not a specific theme or a colour scheme. We just wanted to keep it as bohemic and natural as possible. This meant playing with lots of pastel colours, patterns and fitting into the surroundings. I had a wild-flowers messy bouquet consisted of flowers from the island. Both myself and 3 of our baby flower-girls were wearing a white gypsophila flower crown. 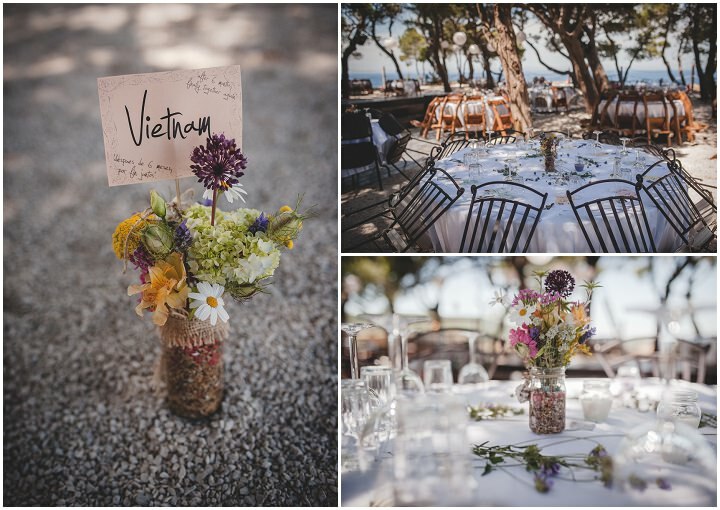 All this was made by a local Vis florist, an incredibly talented lady Nena who did an amazing job and made all the flower arrangements for the day, consisting of beautiful and simple small mason jars filled with sand, pebbles, shells and flowers from the island. 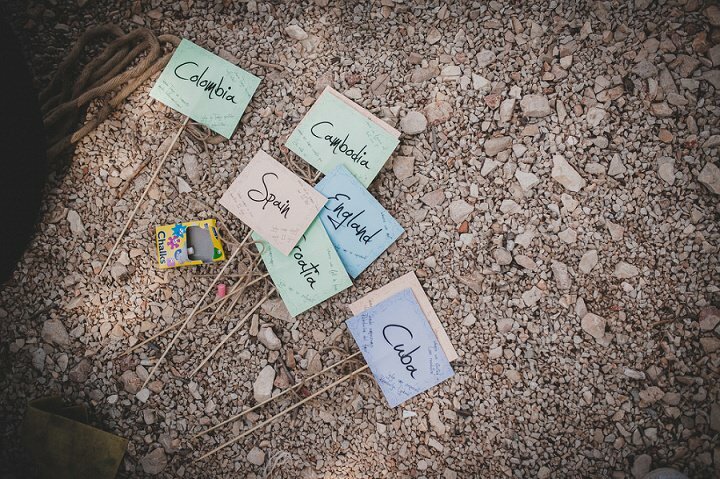 In fact, all flowers were picked from the island, a gorgeous mix of wild and grown, different shapes and sizes, very colourful, happy and summery. The décor of the Fort was quite bohemian, with scattered old chests, wooden tables of mixed shapes and sizes, forming an intimate semi-circle of closest friends and family, seated under the lush pine trees. The wedding table was at the top of the venue, with guest tables moving to the left and right around the pool, respective to Rafa’s and my family, creating a gentle arc around the dance floor. 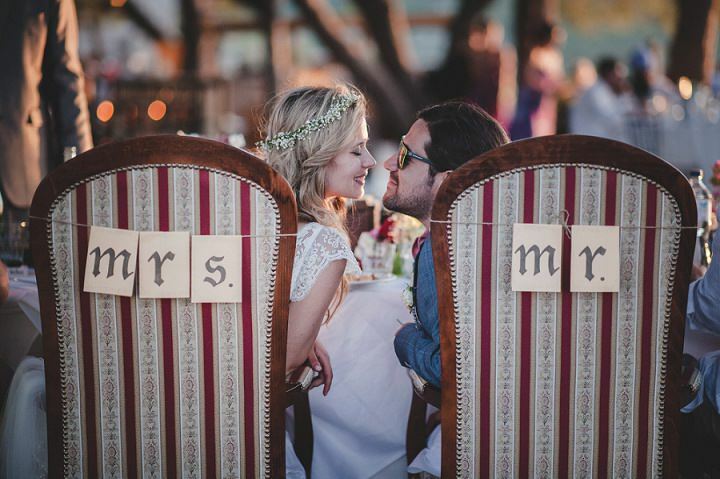 Rafa and myself were seated on a vintage velvet chairs, like true prince and princess, and we placed a Mr. and Mrs. sign behind them. On the front side of the table, we placed “All You Need Is Love” flags, all made by my dear and diligent Maids of Honour. When we did the seating chart we realized we have 12 tables, which is exactly the number of the countries that Rafa and I visited in the last 2 years together, as a couple. So we named tables after countries that we visited, and we left everyone a special thank-you note in 3 languages (for Colombian family, Croatian family and English-speaking friends from all over the world) and placed them next to every table, with a temporary tattoo glued to it, with a cute drawing of us. We had a few vintage sofas and chairs laying around for people to chill in. 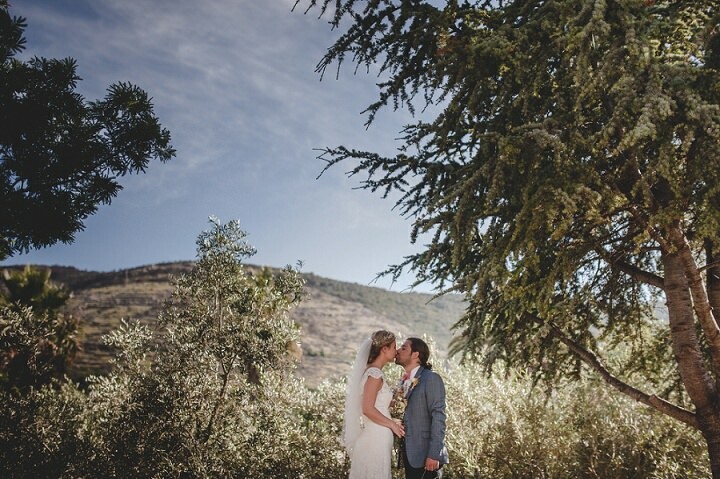 Trees were decorated with dimmed light cream paper lamps and gorgeous hanging Moroccan-style lamps. 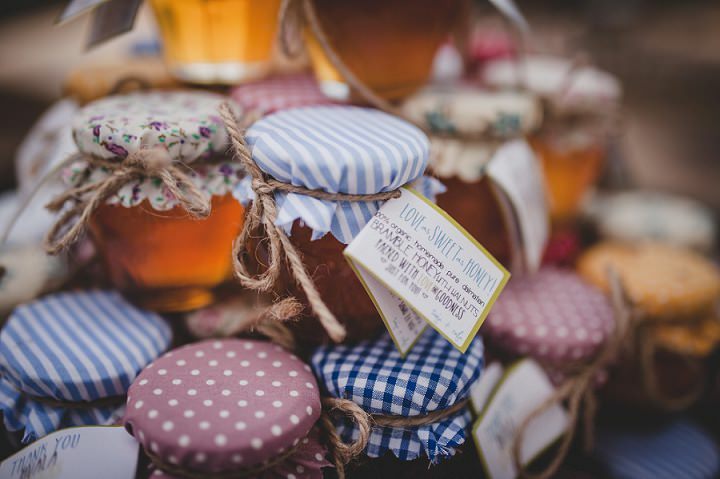 The tables were covered with a simple white cloth, and along with the flower jars, we also had small mason jars with simple white tea lights on each table, with a few scattered branches of lavender and wild flowers. 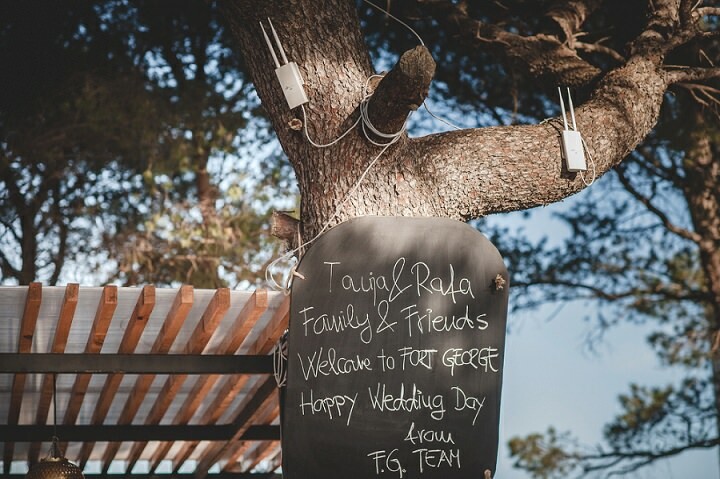 We were lucky enough to have had a very talented Chef and a great Food and Beverage team in general from Fort George who prepared our menu entirely of local Dalmatian specialties. We had a mix of meat and fresh fish that was caught the day before the wedding, as well as locally grown vegan delicacies. 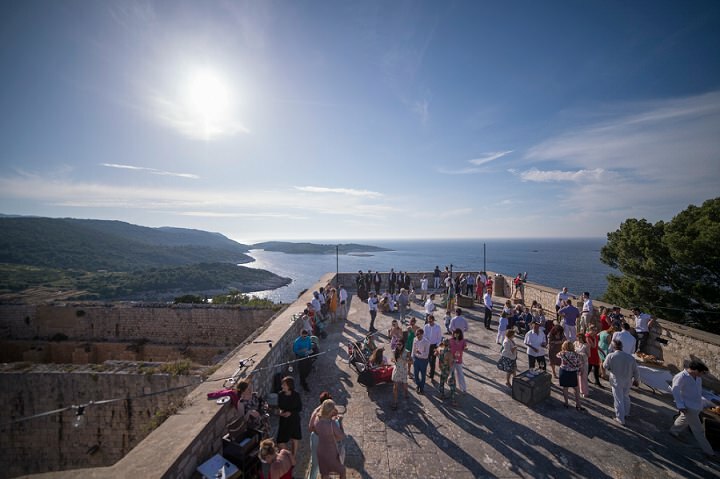 During the Welcome Reception on the roof of the Fort, we served canapés. 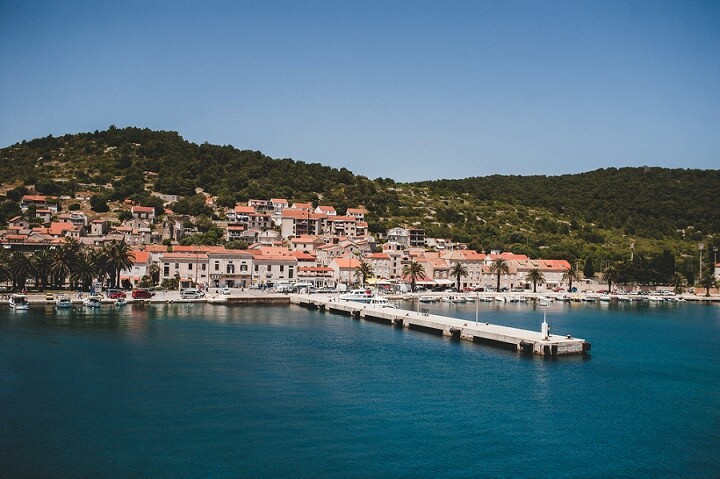 While enjoying the breath-taking view of the crystal blue Adriatic sea and nearby islands, our guest were sipping local wines and famous homemade spirit. Regarding the food, the definite highlight was my grandma Janja’s prosciutto that she was drying for years in her cellar and saving for my wedding one day. 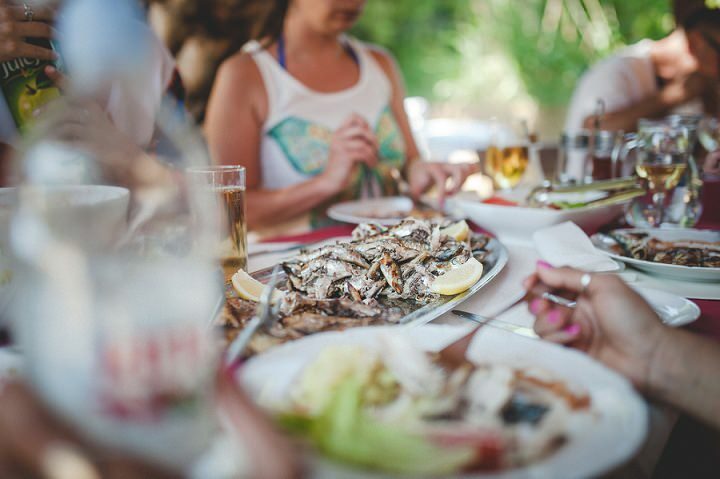 Other bites included a traditional shrimp cocktail, a seared sea bass caught the day before in Vis, served with organic vegetables and on aromatic bread; a selection of local cheeses with famous Vis treat – fig and fennel cake. 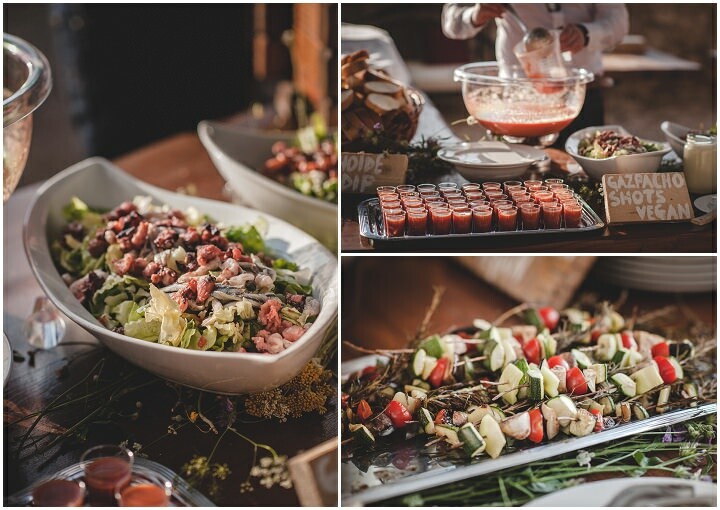 The dinner menu consisted of more delicious specialties from the island, including gazpacho, octopus, seabass, lamb, and plenty of colourful salads, snacks, fresh fruit, charcuterrie catering both for meat eaters and vegans. After midnight we served warm local filo pastry snacks with cheese and spinach called – Burek. 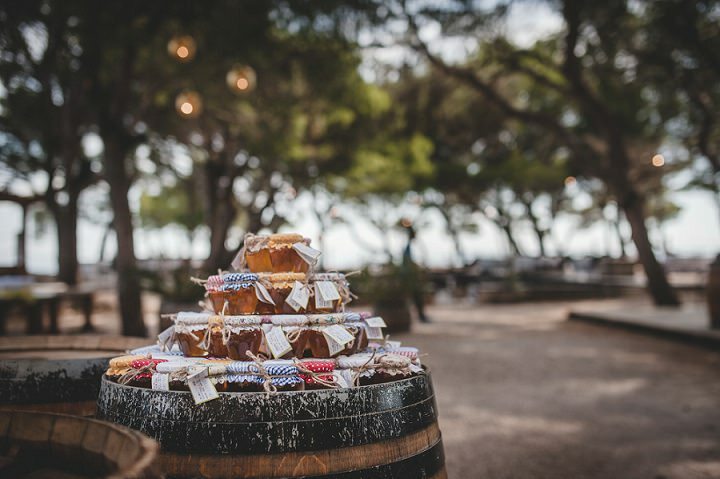 Desserts play a very important role in any Croatian wedding. We take our sweet-tooth seriously. For that reason, we had a massive desert table with somewhat 10 cakes and over 6 different kind of cookies, pastries and small cakes. Important thing is that in Croatia you never buy cakes for important occasions – you always make them instead. 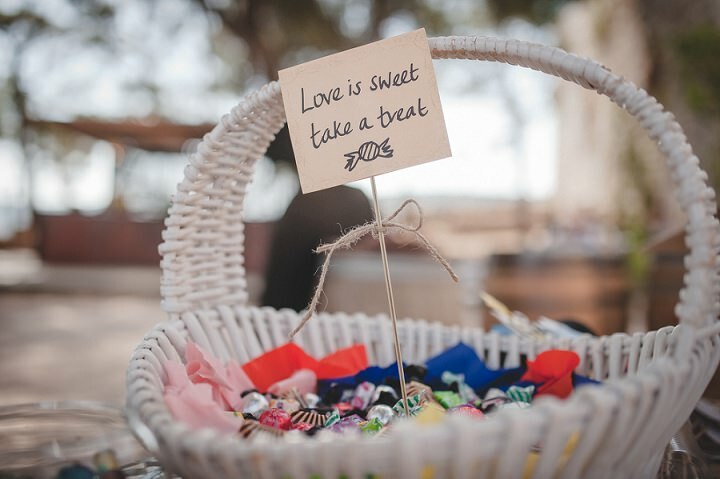 Therefore, all of our deserts were homemade, either by my aunties who each baked at least one cake, and the amazing local girl called Djeni Novacic who made our incredible wedding cake. The Cake was ultimate dream come true – white Lino Lada cream (a Croatian version of Nutella, only white and much better) with almonds and mascarpone, but in rainbow colours! 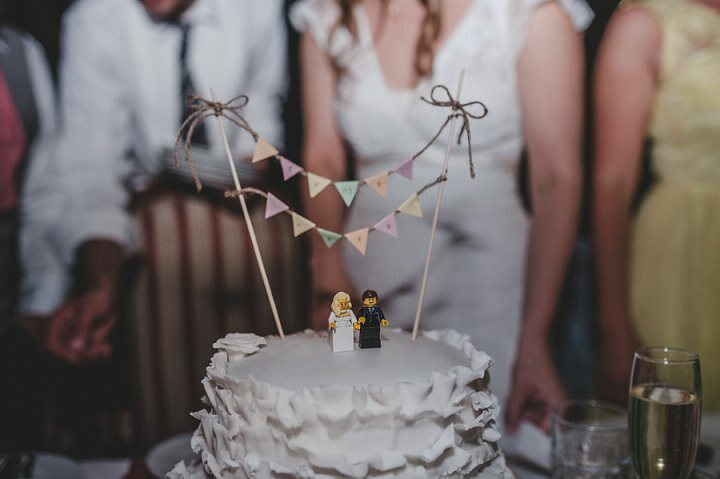 We got little Lego groom and bride as cake toppers which was quite cute. 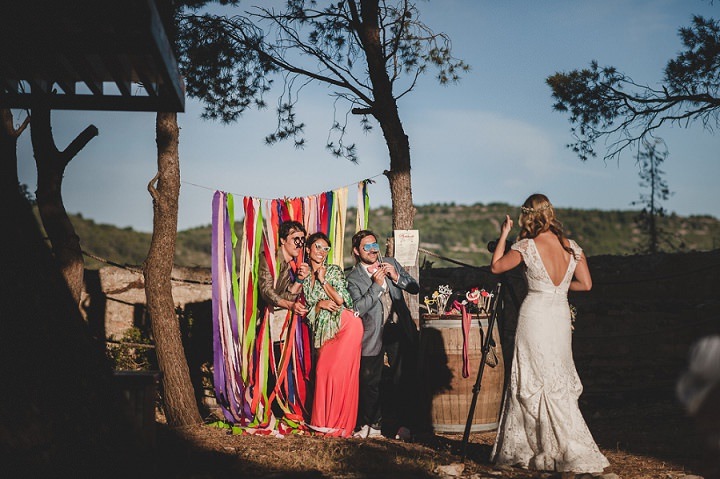 To welcome our guests to the venue, we hired a local traditional male acapella formation ansamble called “Klapa Komiza that were singing well known songs from the Dalmatian region. 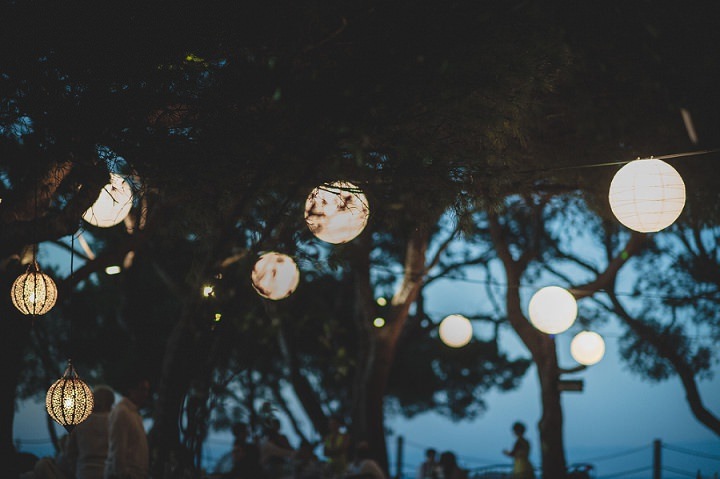 The rest of the night is just in one big hazy blur of salsa and reggaeton moves on the dancefloor, loosing voice on Croatian 90ties dance tunes and Dalmatian serenadas, and dancing the night away with party vibes….in one word – it was spectacular. I designed all of the stationary myself and printed and cut them out in my office (I have the best boss). 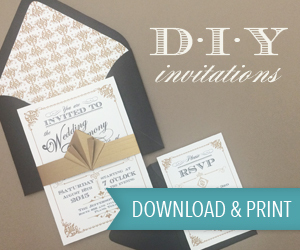 One thing we didn’t have printed is a wedding invitation but instead we created a little video. As we still had some of our family and friends who haven’t met myself or Rafa, we made the video in a way that it introduces ourselves and our love story. Although it was made very amateur-like, it was really well perceived and appreciated by all our guests. 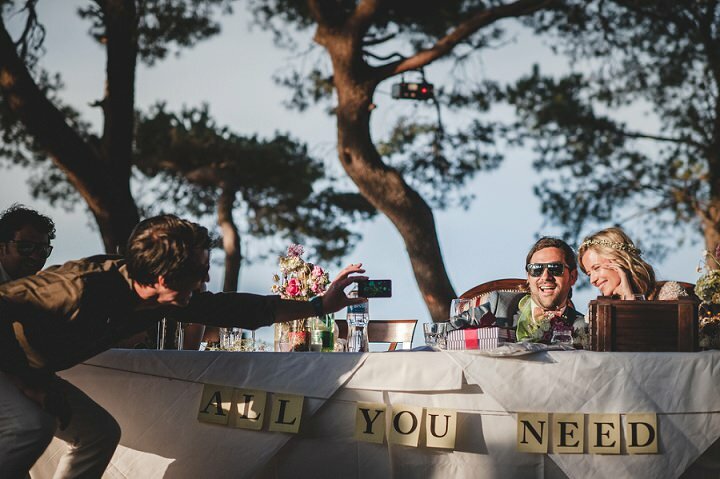 We tried to customize and hand-make most of the things for the wedding, from food to decoration, from music to our outfits, so that every single item carries a bit of our energy captured in them. 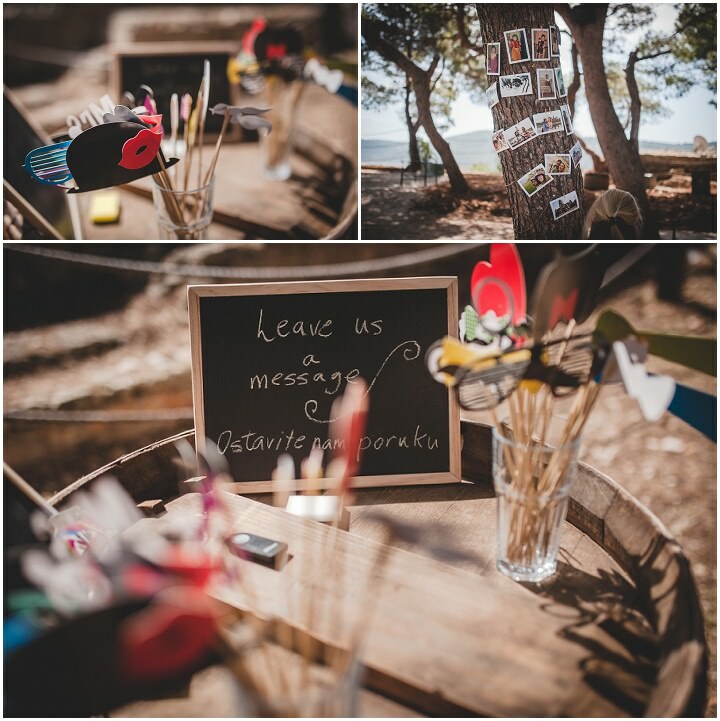 My brother Petar hand carved a gorgeous wooden chest for us to keep all of the wedding advices and cards in. My Annas (Maids of honour) hand made the Thank-you banner that we placed hanging inside the chest, to thank our guests as they were leaving their presents and cards. I really wanted a to have Photobooth as I find them crazily amusing and fun. We couldn’t afford one, so we improvised. Our (awesome)photographers borrowed us a tripod and we used my good, old Nikon D40. I bought a remote on Ebay for £4 that worked well, along with some cardboard props and chalkboard signs for guests to leave us funny messages. My maids of honour bought colourful tissue paper out of which they cut hundreds of long ribbons, and left them hand between two trees. This was such an impactful and beautiful image! My mum’s tears in the Church. The look on Rafa’s face when he saw me walking towards him. Rafa’s whisper to my ear as I sat next to him in the Church. 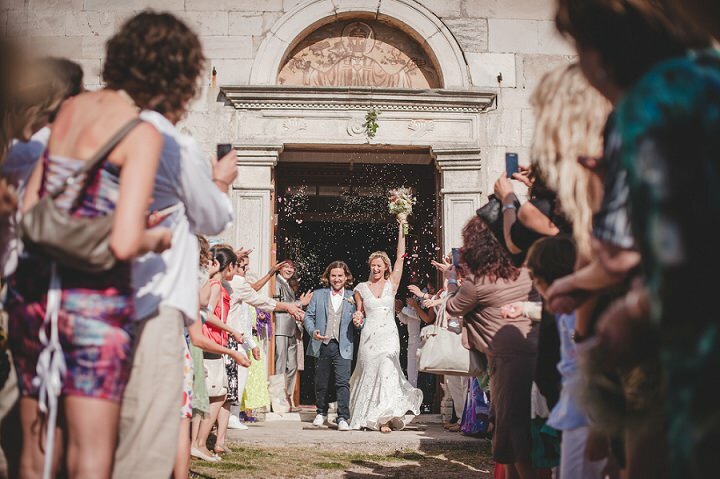 Walking into the Fort, tightly holding hand in hand as a newly wed husband and wife. 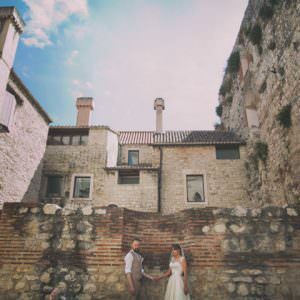 Walking the red carpet through the medieval stone walls of the Fort and entering the Garden area through a green leafy arches, with all guests already waiting for us there. 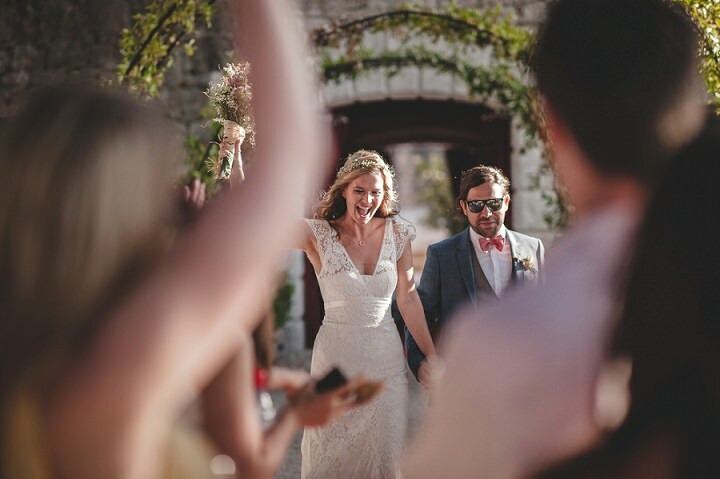 I keep replaying that image of guest applauding and cheering, pianist playing “All you need is love”, and us smiling, walking hand in hand with my price – I truly felt like living my own fairy-tale. Feeling of Rafa’s hands around my waist as we danced our first dance. The sunset. THE sunset. THE MAGICAL sunset of that day. The sky never looked so warm and full of magic. 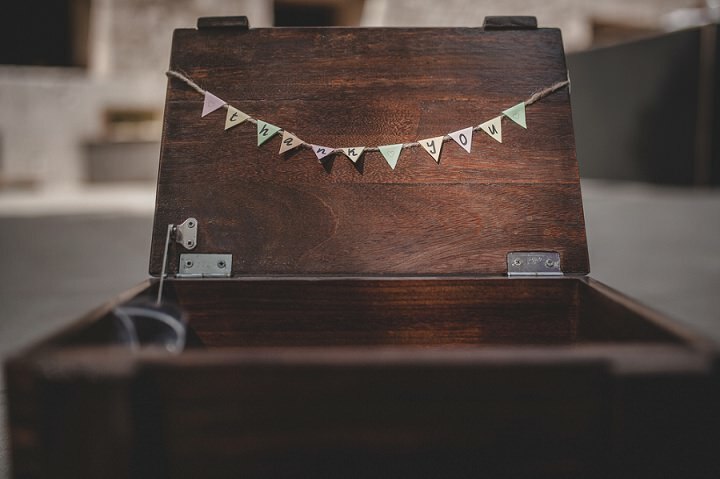 Try to get all small details finalised at least a few weeks before the wedding. This will give you ample time to relax, enjoy and be fully present and absorb every single moment and emotion of such an important day in your life, instead of worrying about logistics and material things. 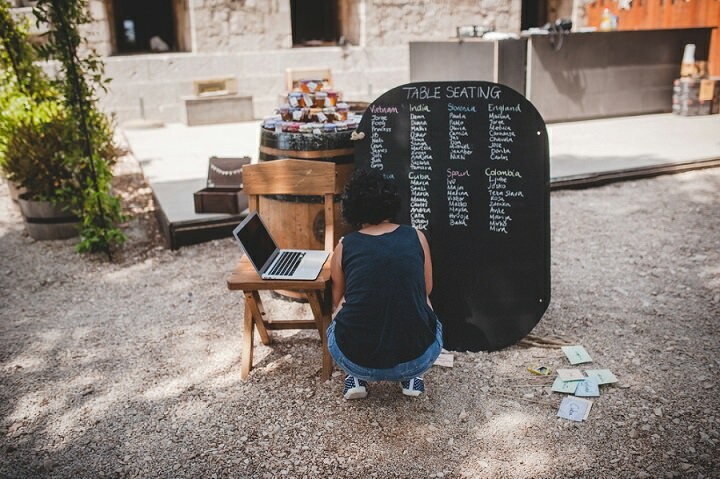 This is probably the only thing that I would change about our wedding, having had another month and avoid torturing my brides maids and myself to do stationary the night before the wedding day. I have to pick out two. 1. Being a musician, music plays a very important part in my life. More so for the most important day of our lives where we carefully picked almost every single song and melody to be played for every moment. 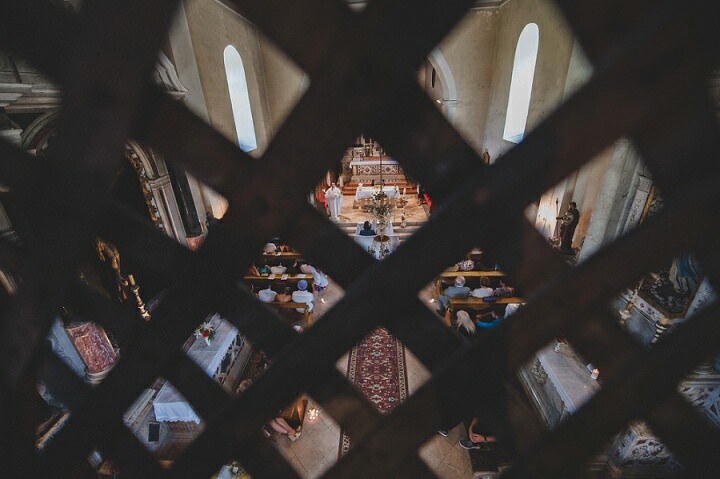 You can only imagine how sad I was to hear that one of my best friends – Matko and Marin, also musicians that were supposed to be playing and singing in the church – were late for their ferry and were not able to plug their instruments in time for the ceremony. I embraced what the fate was giving me, and prepared a song on my computer instead. 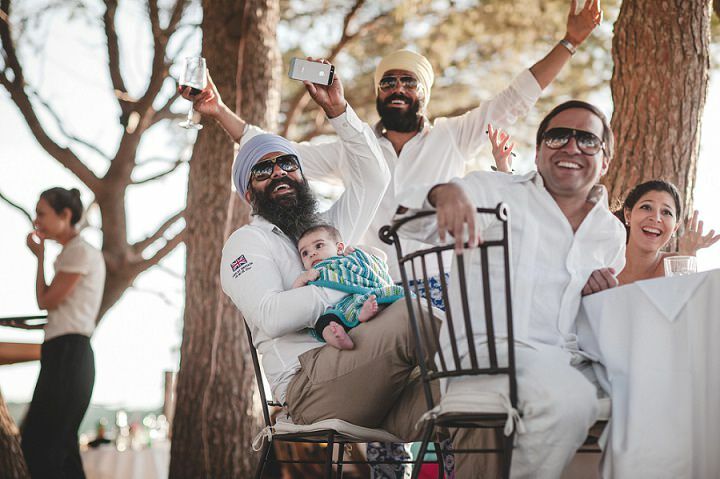 Incomparable to live music performed by such important people… but – it is what it is…You can only imagine my surprise and disbelief as I heard the sounds of ukulele and boys humming a very, very special song for Rafa and me – Jack Johnson’s “Angel”. A cunning last-minute plan organised by my Maids of Honour and the boys who managed to find a ukulele last minute and improvise the song. An unforgettable moment and a gesture that both Rafa, myself and all of the guests will cherish for a lifetime. 2. Unlike in many weddings, Rafa and I were actually the last ones to leave the dance floor. 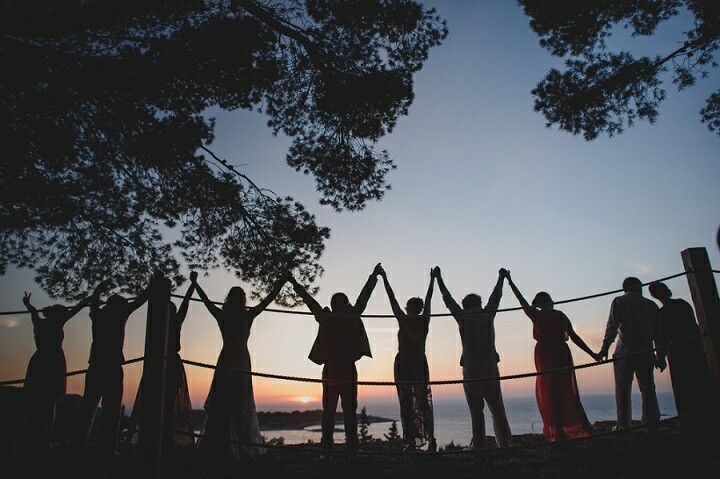 In Croatian tradition, Bride and Groom are supposed to greet and hug every guest who leaves the wedding. This meant that we were dancing and having fun until the dawn. One of the greatest surprises was Rafa and me entering our room at 4am, and finding the most unexpected and romantic scene ever. Entire room in candlelight rose petals, chocolate hearts and a special note. And as that wasn’t enough, there was a gorgeous white lace sleeping-dress that my mum prepared for my first wedding night. 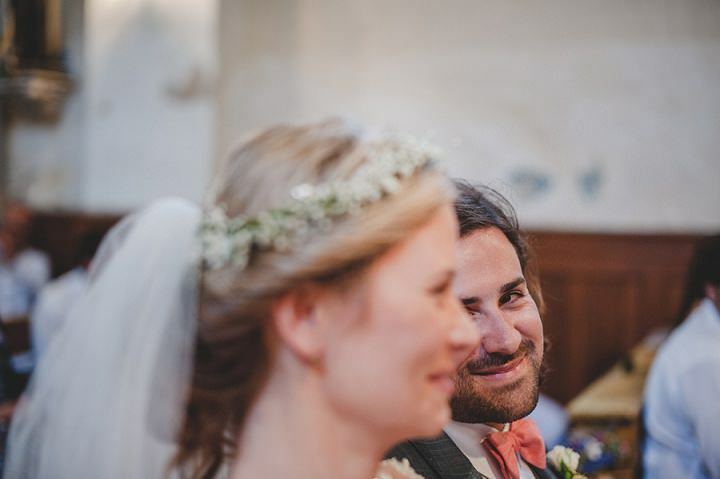 The whole experience was just so beautiful that it made me cry… all done in secret by my mum and bridesmaids! 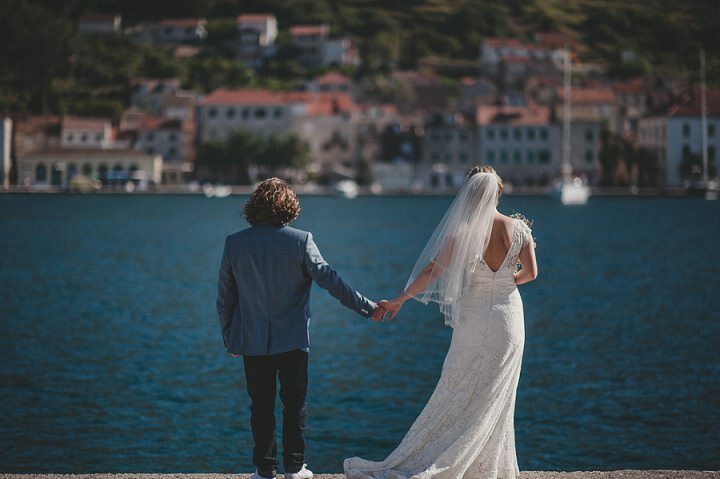 As a fellow wedding photographer from Croatia, I’m always excited to see our local photographers featured on world renowned blogs, well done One Day Studio! 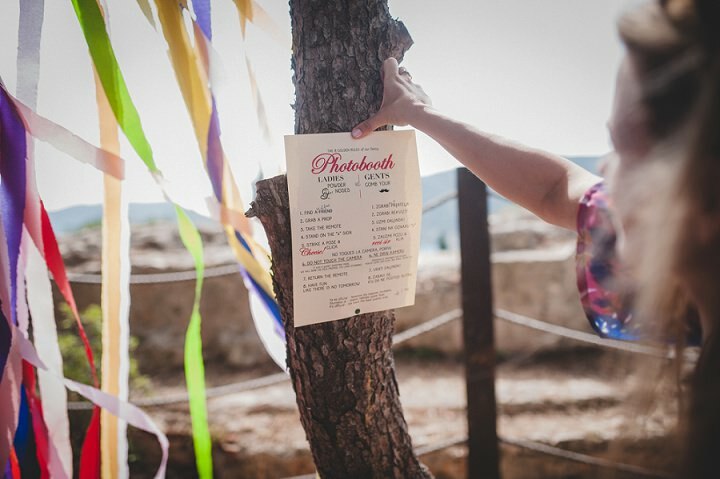 Amazing photos, another proof Croatia makes for a perfect wedding backdrop. 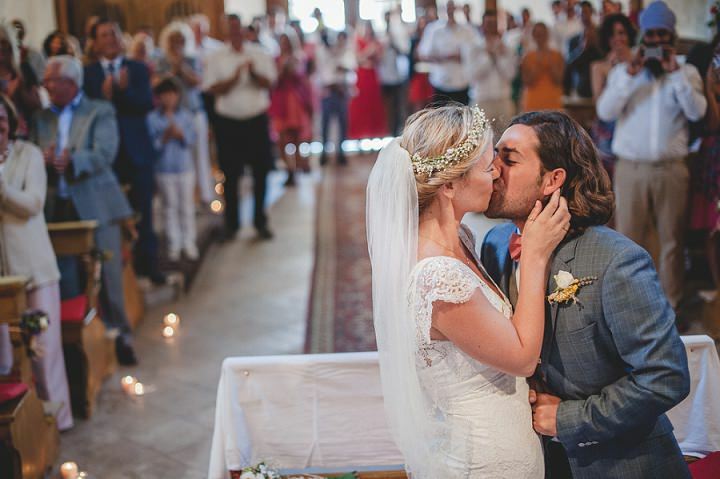 What amazing photos, so different from the usual wedding pics!